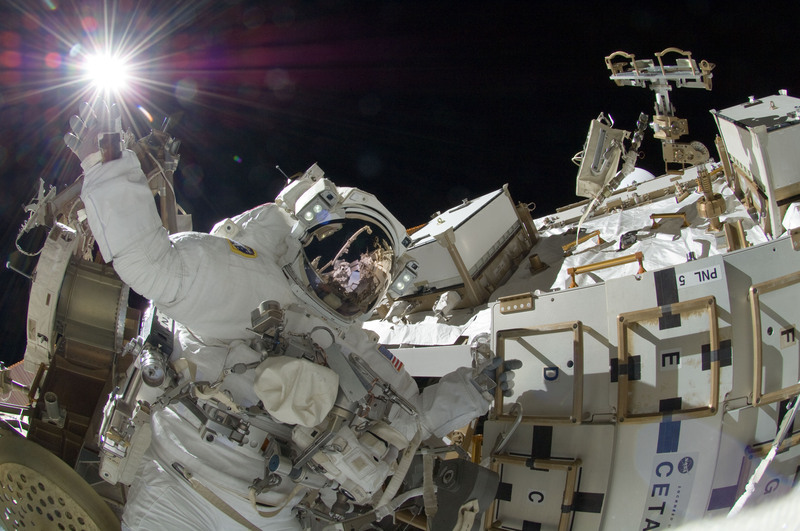 NASA spacewalker Sunita Williams looks as if she's reaching out to touch the sun in this picture, which is one of the coolest views ever sent down from the International Space Station. Of course, the sun is actually about 93 million miles behind her. This is one of those joke pictures like the ones that show someone plucking up the Eiffel Tower — only it was taken in outer space. In addition to the Suni vs. sun angle, this picture is special because the photographer is mirrored in Williams' shiny helmet visor. If you look closely at the full-resolution image, you can catch sight of Japanese astronaut Aki Hoshide holding up the Nikon D2Xs camera that took the picture, with one of the space station's solar arrays behind him. The setting reminds me of Neil Armstrong's famous Apollo 11 picture of Buzz Aldrin, which similarly shows the photographer's reflection. Why Can't Astronauts Whistle in Space?